Reginald Francis Lewis was born to a working class family in East Baltimore on December 7, 1942. His strong work ethic was evident early when in high school he earned four varsity letters in baseball, three in football, and two in basketball. Lewis graduated from Virginia State College in 1965 and three years later attained a law degree from Harvard University Law School. Lewis worked as an attorney with the firm of Paul, Weiss, Rifkind, Wharton & Garrison between 1968 and 1970. He then became a partner in Murphy, Thorpe & Lewis, which was the first black law firm on Wall Street. Between 1973 and 1989, Lewis was a successful corporate lawyer in private practice. By the mid-1980s Lewis would soon enter an elite circle of Wall Street deal-makers. In 1983 he started TLC Group, an investment firm that made history when it acquired New York-based McCall Pattern Co., for $22.5 million in 1983. Four years later Lewis sold McCall Pattern for $90 million, realizing a $50 million profit. In 1987 he began the leveraged buyout of Beatrice International Foods, a global giant with 64 companies in 31 countries, for just about $1 billion. He relied on his financial and legal ability and the efforts of Michael Milken, a newly hired business partner. By acquiring Beatrice, Lewis had achieved at that time the largest corporate buyout in an era of such gargantuan-deals. With control of Beatrice International Foods, Lewis now managed a commercial empire that spanned four continents. With a net worth estimated by Forbes Magazine at $400 million in 1992, Lewis had became one of the most successful entrepreneurs and the wealthiest black man in history. With his growing wealth Lewis became a philanthropist. In 1987 he created the Reginald Lewis Foundation which donated $10 million to various non-profit organizations. He also made an unsolicited gift of $1 million to Howard University, an institution he never attended. His 1992 gift of $3 million to Harvard University Law School was the largest single donation in its history. The gift created the Reginald Lewis Fund for International Study and Research. 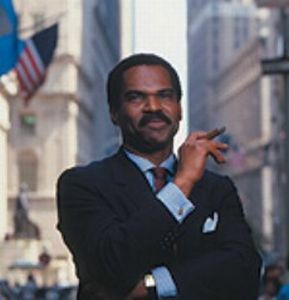 Reginald Francis Lewis died unexpectedly from brain cancer in New York City in 1993 at the age of 50.